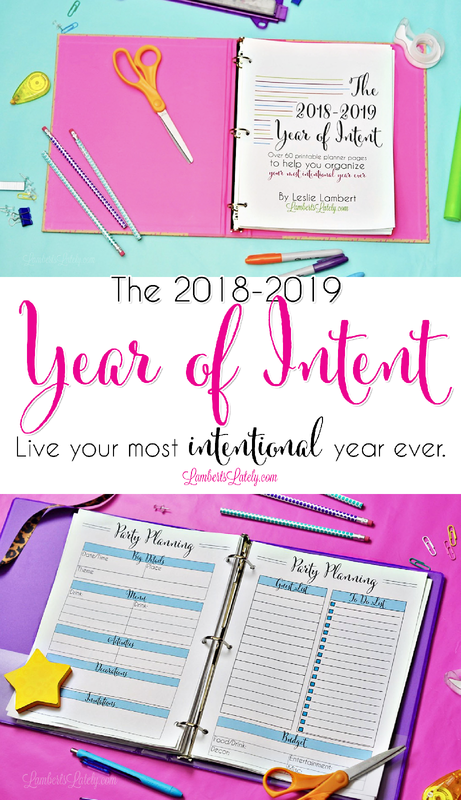 Year of Intent - Over 60 pages of Planner Printables for scheduling, budget planning, intentional living, and more. 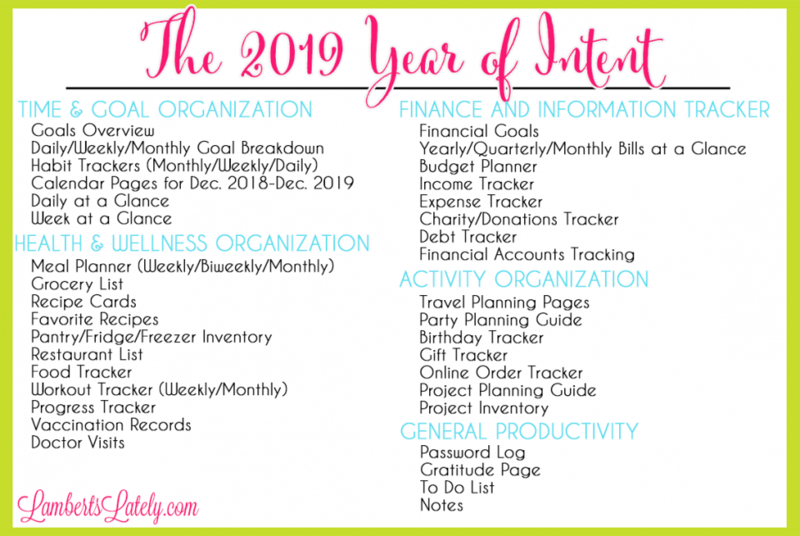 Start living your most intentional, organized life with the 2019 Year of Intent. Intent is the act of following through with a plan in a purposeful, directed manner. To put it another way, it's living with a purpose. Isn't that how we all want to live our lives? Sometimes, we just need a system for planning out that intent. That's where the 2019 Year of Intent comes in. I wanted to create a complete organizational resource for planning and executing a life that's intentional and meaningful. With this set of over 50 planner printables, you'll be able to plan and live your most organized, purposeful life. Hi! 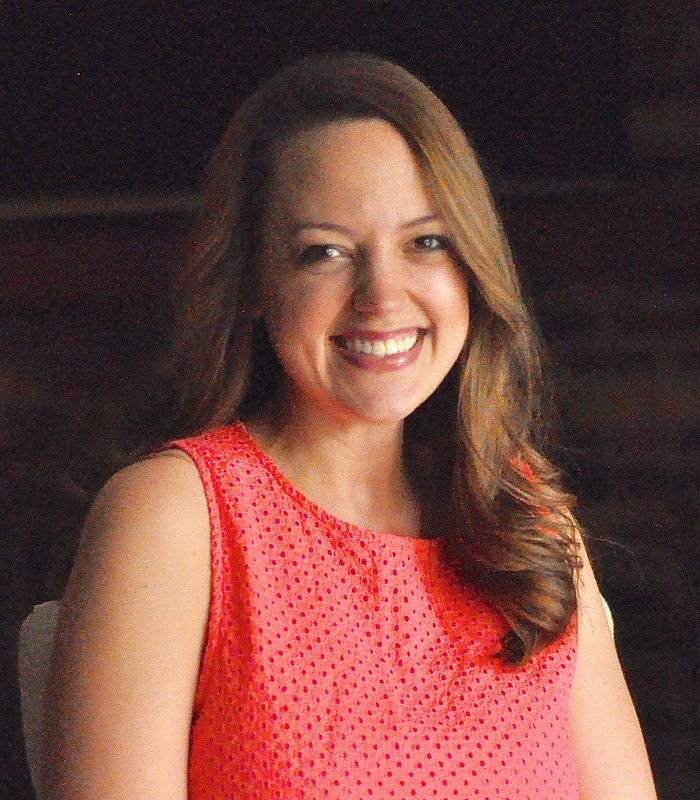 I'm Leslie, and I'm the blogger behind LambertsLately.com, where I discuss life, beautiful finds, and anything home. On my blog, I absolutely love talking about homemaking: cleaning, recipes, organization, and even the occasional mishap. natural next product for me to release was a way for readers to organize their time in the most intentional way possible. "Intent" was kind of my word for 2018. I wanted to start organizing my time in a way that made it as productive and effective as it could be. As I started to think about ways I organized my time, I thought it would be a great idea to share my organization methods with readers. Thus, the 2019 Year of Intent was born! In this collection of over 60 pages of coordinated printables, you'll get organizational tools to effectively plan out many different aspects of your busy life, including goals, schedules, activities, health, fitness, finance, and overall productivity. Your life includes so many different categories; your planner should as well! With your purchase, you'll receive a digital file (in both full and half-page sizes) of every printable listed above. The great thing about receiving this as a digital copy is the opportunity to pick and choose what matters most in your planner. You can print as many copies of each page as needed; on the other hand, if you don't need a page, that's ok! There's no point in cluttering your planner (after all, we're aiming to live with intent, not fluff). If something doesn't apply to you, simply leave it out! Want a free preview of the 2019 Year of Intent? Sign up for updates below to receive a free preview in your inbox! Could I design this planner myself? Could you? Maybe. Would I recommend it? No. 😉Countless hours of planning, research, and design went into this project. I've used years of graphic and printable design skills (as well as several design programs at my disposal) to create a high-quality collection of planner files at a low price! What makes this planner different from other digital printable planners out there? This is a planner designed by a busy mom for busy moms. I took needs from my own life (and spent hours upon hours researching the needs of other women) to design a planner that can actually be used. It's nice to have a planner, but pointless to have one you can't integrate into your own life. The 2019 Year of Intent was designed with you in mind; this collection is hand-tailored to the needs of our diverse, hectic lives and covers many different areas. Don't worry; my guidance doesn't stop once you buy The Year of Intent! Each set of pages has a short summary and ways to use the page to live intentionally. You can pick and choose which pages you want to use for purposeful living once you buy. I recommend using 8.5x11" paper (typically found in home printers) to print your pages. They are best viewed in color (as sections are color-coordinated), but can be printed and effectively used in black and white as well. You'll receive both full-size and half-size page files with your purchase, so you can choose whether to use a standard binder or a 5.5x8.5" mini binder for your planner pages. The 5.5x8.5" mini pages can be printed on standard 8.5x11" paper and simply cut in half. Can I edit these pages? Is this a physical product that will be shipped to my home? When you purchase The Year of Intent, you will receive a .pdf digital copy within a few minutes of your purchase. That means you will be able to download the files for the eBook immediately and print as needed for your own personal use! This is not a physical product; nothing will be shipped to you. Can't I just find all of these files for free online?